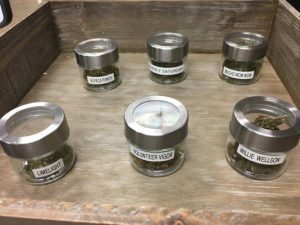 A new Clarksville businessis promoting natural “Tennessee-grown” wellness through the healing properties of hemp, minus the “high” associated with extracts for marijuana use. The products retailed at Tennessee Hemp Supply, 2680 Trenton Road, are safe, proven and legal, says Trinity Mealor, president and CEO. The chief ingredient and common denominator in Tennessee Hemp Supply’s wide range of natural health products is CBD, short for Cannabidiol, which is extracted from hemp. “We’re trying to focus our attention on educating the community on the benefits and applications of CBD,” Mealor said. “CBD is an active chemical compound that’s found in the cannabis plant, and these are all good, effective products. “CBD doesn’t get you high, and medical studies show the health benefits of it,” he said. Tennessee Hemp Supply has business locations in Murfreesboro, Shelbyville and Cookeville, along with the 1,200-square-foot Clarksville location. Further expansion plans are on the table. This year marks the first that Tennessee has allowed farmers to grow high-CBD hemp in their crops for processing. “Most clientele have never used CBD before and come to us looking to be educated about a natural supplement that can help with numerous health issues, or want to start a daily regimen to a healthier lifestyle,” Mealor said. Some of the key CBD-based products that Tennessee Hemp Supply sells include “Bell Buckle Body Butter” designed to relieve pain and inflammation, a roll-on “pain-repellent” formula, water-soluble “Chill Pills” intended for reducing anxiety and physical pain, and, Mealor noted, there are items specially designed for reducing anxiety in pets. Tennessee Hemp Supply can ship most of its products to all 50 states.